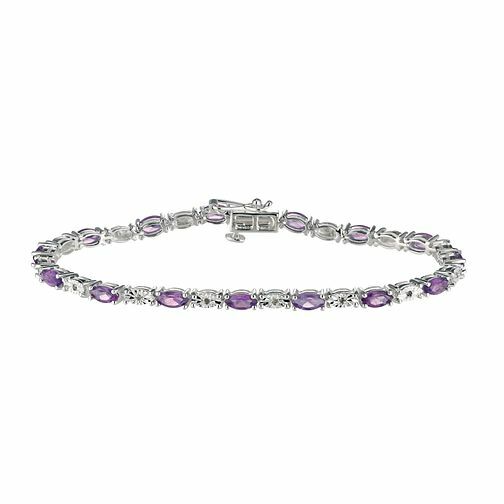 Sterling silver delicate bracelet made up of oval shaped amethyst and diamond stones. Sterling Silver Diamond & Amethyst Bracelet is rated 3.7 out of 5 by 7. Rated 5 out of 5 by Anonymous from Beautiful bracelet I was looking for a bracelet to match a earring and pendant set that I bought years ago. This bracelet matched my set perfectly. The quality of the amethyst is superb and the store attendant checked the quality of the diamonds when I went to pick it. I am very impressed with product as well as the customer service that I received. Rated 5 out of 5 by Anonymous from Absolutely Beautiful Bracelet. Bought for a Christmas present for a lady friend so this review is my opinion. She loves amethyst stones and this is an addition to two previously purchased items from H. Samuel, namely amethyst necklace and matching earrings. The quality is outstanding and it looks absolutely beautiful, perfect gift if you like amethyst. I know she will be delighted with this gift and I would recommend it to anyone.